Economic growth may be anemic but fraud continues to find a life of its own. According to the Financial Fraud Research Center, at least 30 million people are impacted by fraud each year with an annual cost of $100 billion for retail fraud alone. In a 2011 speech, the head of the U.S. Securities and Exchange Commission discussed how key offices and divisions are working together in all areas of its anti-fraud efforts and how the SEC is collaborating more frequently with state regulators, criminal prosecutors or local nonprofits in an effort to weave these initiatives into an increasingly fine-meshed net that is focused on fighting fraud. While the U.S. Department of Labor is not exclusively focused on fraud, enforcement teams have been busy with a closure of nearly 3,500 civil cases and 302 criminal cases, monetary results of $1.39 billion and 129 indictments. 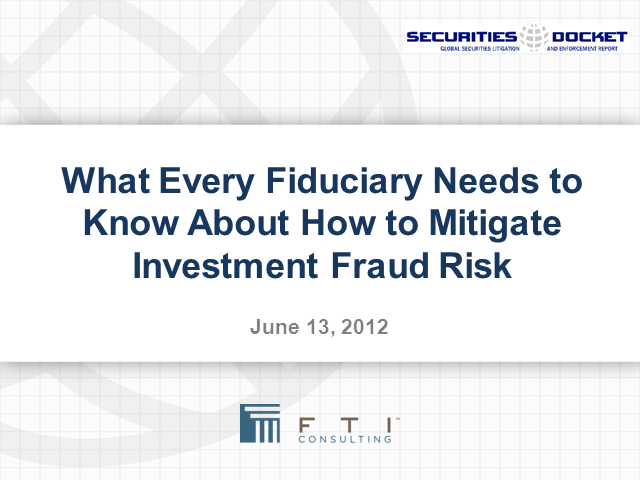 • Regulatory action to stem financial fraud and preserve the integrity of the capital markets.